Looking for some guidance on my 2015 XP. I had noticed a slight left lean in the rear when wrenching on other parts this past month or so, didn't think anything of it and chalked it up to my concrete slab section running that way toward my center garage drain. I plan on pulling my sway bar this week and seeing if it lays flat, if not they seem cheap enough on ebay it's a non issue. Just want to sort out the wobble. Previous owner did roll it over and cracked the plastic rack but it was a tip over 0 mph incident. I also will check suspension and double check tire size as obvious ones. Threading was the same each shock but the sleeves cover up some details. Wheels seem to true with no bent rims, but I will be doing a clutch so all 4 wheels will be off the ground and can confirm. Disconnect the sway bar and see if the lean levels out. The handle bar shimmy could be tires or CV shafts on the front end, wheel bearings, tire rods ends, combination of all. Put it on jack stands and remove the tires, run without the tires and see if you have the shimmy. On my old 600 the CV joint was stiff and the tie rods were loose/worn out and the that was the cause of the shimmy I had. I'd all the above as mentioned..... and maybe also the a-arm bushings too. If all checks out, find yourself some balance beads for the tires!! 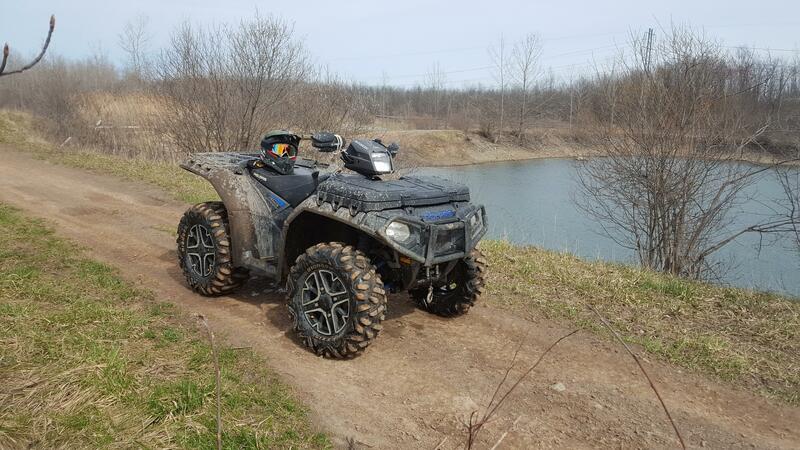 As ATV tires are rarely balanced!! I just replaced all 4 wheel bearings and pumped them and all 19 fittings of nice heavy duty grease. Bushings on a arms looked fine when I popped them out but only checked bearing carrier side, not frame side. Hoping to wrench tonight and get it sorted. Sway bar seems straight, rear end still looks low on left, going to remove rack as I think it's just bent a bit from rolling over on left side. Nothing is broken or cracked, thinking just a top side issue that can be remedied. Any good ideas to get all 4 wheels spinning in air. I have 4 jack stands but no where near tall enough. May try to stack with some wood. Really want an atv lift about now. Well I went out for about 25 miles on local trails this weekend as is. I discovered the rear end fender leans down due to the U-shaped rack under the plastic rear rack is broken just off center to the left side, allowing everything to sag. I can physically lift everything up a good 2 inches. I was told this when I bought it that the rear was cracked and I could get a new one I just was focused on evaluating other features at the time when I was about to buy it. It is something I could leave forever and it would never matter until I had decent weight back there then the plastic fender would bear the weight and possibly cause it to become worse. I'll unbolt the plastic rack and see the full extent soon. With regards to wobble, it may just be an atv that I am expecting to ride smooth and perfect on pavement. It doesn't appear to be speed sensitive as I did 40ish several times and it was fine for all but one where it jiggled a little then went away with slight weight shifting or throttle adjustment. I also pulled to 70 a few times and it was almost non existent, I think I may be ok. The biggest time and frequency/repeat ability is when I am on pavement and it engine brakes down from 25+ or braking down from speed, and it comes and goes quickly. 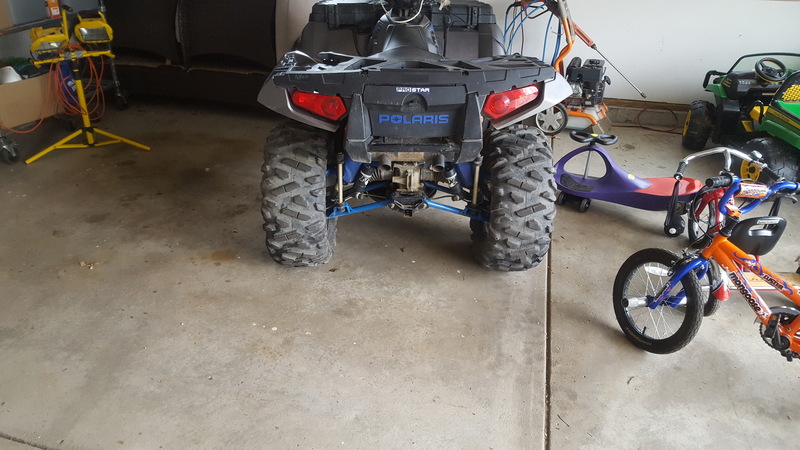 I may balance the tires as it can be a cheap easy improvement and see how that does, still need to get all 4 wheels off the ground, decided to ride instead of wrenching as my time is limited with kids. I was also only to bring the front end up in low gear on grass. Should a 1000 be able to easily come up in high from 0 or low speed? I have some hopping/lurching during engagement and I had my belt slip once doing ~5k rpm in low and punching it (on dirt) yesterday where it banged on the rev limiter. I ordered a new belt but during riding only 3 mph and under including engagement I experience the not so smoothness. Not a major problem but could be better. I am adjusting to quads so trying to get a baseline for performance around, honestly underwhelmed by "1000 performance" I heard so much about when doing the 570/850/1000 shopping, when compared to people saying it's way more than you'll ever need. Trying to decipher if it's coming from modified 1000 cc sport bike experience or a slightly worn belt and/or how cvt's engage in general, or if everything is fine and it is what it is. Need to ride some other atv's to really gauge this but overall I am having a blast and thrilled I just went with the 1000 off the bat. I would have been disappointed with the raptor 700 given the places I have been going. Mine will wheelie from a stop in high and low all day. Slide back on the seat and grab a thumb full of throttle my bet is your belts slipping or your tires are just spinning and not grabbing. Try it on pavement and that will tell you for sure. I almost flipped my 2018 when I got it without even trying. It will also wheelie at lower speeds if I have traction and hit a little hill or bump. I went to the 1000 from a 2015 sp850 and love the extra power. They are quick from o to 60 or so.